Please refer to our stock # HRbon when inquiring. 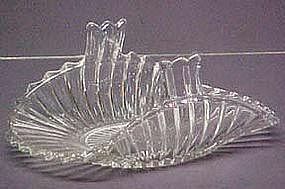 Heisey Ridgeleigh crystal Bonbon is 6.75" long, with turned-up handles. Produced between 1935-44. In excellent condition.